I bought this basement kit from Minimaailma for my Erlenhof dollhouse, because I needed more space for the kitchen. I am going to put the kitchen in the basement floor. 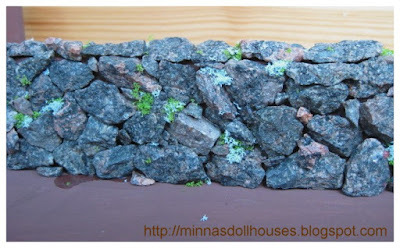 I have been painting the basement exterior and I made a stone fence in front of the house. I found suitable flat crushed rocks in our own yard. The moss in the fence is made from Flower Soft. Flower Soft is a new product for me and it has been exciting to find out ways how to use it. Ostin tämän pohjakerroksen Minimaailmasta nukkekoti Erlenhofiin, koska tarvitsin enemmän tilaa keittiölle. Päätin laittaa keittiön pohjakerrokseen. Olen maalannut pohjakerrosta ulkopuolelta ja tein talon eteen kiviaidan. Löysin omalta kotipihalta sopivia littanoita murskattuja kiviä. Aidan sammaleen olen tehnyt Flower Softista. Flower Soft on minulle uusi tuote, ja on ollut jännää keksiä sille käyttökohteita. Minna- I love the wall!! The moss is so beautiful! How does the basement kit open to access the rooms? I am glad you posted- because I need to email you and this reminded me!! Hope your day is lovely!!! The stone fence is so beautiful! Great work, and I like the use of Flower Soft. I haven't heard about that product before, looking forward to see more of your use of it! What a great idea to add a basement to your house! This is just lovely, beautiful job!